2016 was a record-breaking year and had the best investment performance since the financial crisis in 2009. With over EUR 4.5 billion transacted in 2016, Poland remains the standout investment performer across the CEE region. The market was dominated by a number of very large transactions, including stand-alone assets and portfolio deals. The transaction pipeline indicates that the total investment volume in 2017 should reach the similar level to those from 2015 or 2016. 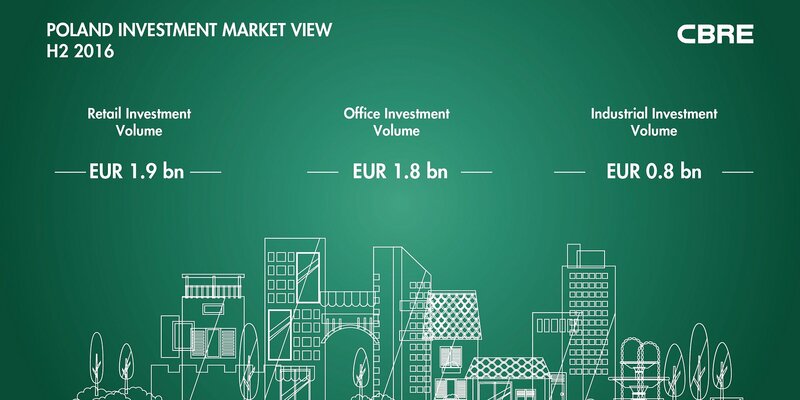 According to the latest “Poland Investment Market View H2 2016” prepared by CBRE, in Q4 2016 the total investment volume was boosted by 6 substantial investment transactions on the Warsaw office market, which were responsible for 15% of total investors’ activity in Poland. The largest transaction of the year however was a corporate transaction with Redefine acquiring a substantial stake in the Echo Investment portfolio. 43% share of the overall investment market in 2016 was gained by the retail market (EUR 1.9 billion), followed by the office market accounting for 40% (EUR 1.8 billion) and the industrial sector with a 17% share (EUR 0.77 billion). Foreign capital accounted for approx. 97% of all purchases in 2016, with the major investor players originating from South Africa, followed by United States, United Kingdom and Germany. The strong investment transaction volume recorded in 2016 demonstrates that Poland remains a favoured destination among international investors in spite of concerns over the political situation and significant pipeline in the office and logistics markets. Ultimately, the strong economic fundamentals continue to underpin strong growth which has manifested itself in record years of net absorption in both sectors which has largely resulted in virtually all new space being leased. The EUR 4.5 billion traded was a post crisis record and activity was witnessed across sectors with office and retail dominating. We are expecting that the situation on the Polish investment market will remain positive in 2017 and will be stimulated mostly by strong occupational markets across all sectors, relatively high yields and the high quality of available assets on the market. Besides international capital, we see increasing interest from CEE funds which are planning to enter the Polish market. Prime yields are continuously on a compression path in all sectors of the commercial real estate market. In Warsaw prime office yields are estimated at the level of 5.3% whereas in regional cities the prime office yields are estimated at the level of 6.25%.